Hearing aids are just the beginning of your journey to hearing better, the best hearing aid in the world won't help unless it is fitted correctly. We understand this clearly and it has shaped our thinking on many facets of our Practise. From the equipment we use, through our testing and fitting processes to the Patient Journey we offer. This is why we have invested so heavily in state of the art equipment in order that we can deliver a premium experience and the results you expect. We use the Aurical fitting system from our equipment partners GN Otometrics. 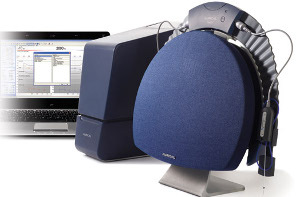 The Aurical has set the industry standard for hearing testing, and hearing aid fitting equipment. The system interfaces seamlessly with our office systems. The Aurical handles virtually every audiologic function necessary in a modern hearing Practice. Our Aurical has been enhanced by advanced multimedia dispensing solutions, Visible Speech Mapping and Virtual Reality simulations supports our fitting and fine tuning process. Our fitting suite is like no other, it allows us to verify the hearing aids in real time ensuring that they are delivering what you need when you need it. Our surround sound virtual reality system allows us to put you in those real world situations where you are having problems in order that we can test the efficacy of the hearing aids. We always undertake state-of-the-art real ear measurement to verify every device we fit. To add to the accuracy of the threshold testing, we carefully measure the frequency shaping of the device while it is situated in the ear. This fine-tuning of the device is a critical step in delivering all of the benefits you should get from your hearing aids. With Real Ear Measurements, the individual shape and size of your ear canal and its affect on the sound you hear are taken into account. Our Aurical Visual Speech Mapping allows us and you to see exactly what the hearing aids are doing with speech so we can change and define the signal to serve you better. This ensures that the hearing aids are delivering to you the full benefit and reaching your needs. Most of your problems are probably in those complex real world sound situations. Our Aurical surround sound virtual reality system allows us to put you in those real world situations where you are having problems, in order that we can test the efficacy of the hearing aids. It is easier for you to see the benefits and for us to make the changes needed when you are in our interactive real life situations.